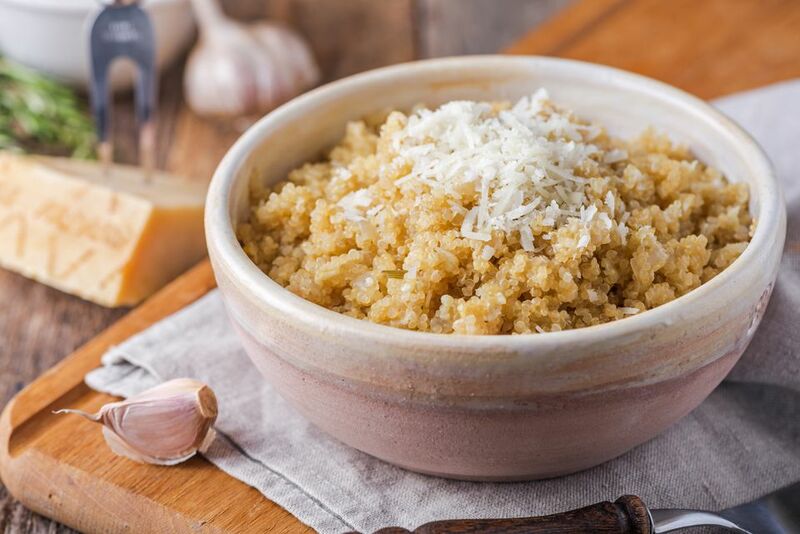 This is an easy vegetarian recipe for whole grain quinoa flavored with garlic and Parmesan cheese. Parmesan garlic quinoa isn't quite enough to make a full meal on its own, but it's a good start. It would be great alongside some tofu, a side dish of vegetables, or maybe even alongside a simple vegetarian stir-fry. Next, add the vegetable broth and the quinoa. Cover the pan, and allow it to simmer until the liquid is mostly absorbed and quinoa is cooked, about 15 minutes. Remove the pan from heat and gently mix, or "fluff," the quinoa with a fork to fully distribute any excess moisture. Season your quinoa lightly with salt to taste, and add the Parmesan cheese, stirring to combine and allow the Parmesan cheese to melt. Or, for a vegan version, mix in nutritional yeast instead of the Parmesan cheese.